Designing your wedding flowers can be a daunting task, but when you choose Y-Knot Flowers as your wedding florist and event design studio, you take the stress and worry out of the picture and put gorgeous dream wedding flowers into the picture. We at the Y-Knot Arizona flower shop have been creating beautiful weddings in the greater metropolitan Phoenix area for over twenty years. As your wedding florist, Y-Knot Flowers can design stunning bridal bouquets and bridesmaid's flowers as well as corsages, boutonnieres and ceremony décor that fit your unique style. We offer full service rentals so whether you are looking for an arch, a chuppah or columns for your ceremony, we can help! We also offer indian wedding flowers and specialties, such as Mandaps, Chori's and Varmaalas. Your reception should be a continuation of your Phoenix Wedding Style. We specialize in providing the wedding flowers AZ residents want. Not only can we design your fresh floral centerpieces and buffet accents, but we can also help you design your entire event from the linens to the backdrops to the china. By offering one stop design service you won’t have to shop all over the Valley; instead you will save time and money and create a personal wedding experience with one of our consultants. Don’t forget the rehearsal dinner and bridesmaids luncheon! All aspects of your wedding can be rolled into one wedding package for an even easier planning experience. 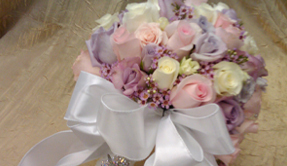 Y-Knot Flowers also offers the services of the only Master Wedding Vendor, ABC, in the State of Arizona. So don't wait, call and make an appointment with one of our event specialists and design your dream wedding with us. You dream it ~ We design it! Copyright 2019 - Y-Knot Rentals, LLC - All rights reserved.